Writing Bootcamp is best suited for students who need a final push or are near the final drafting or revision stages of their writing projects. 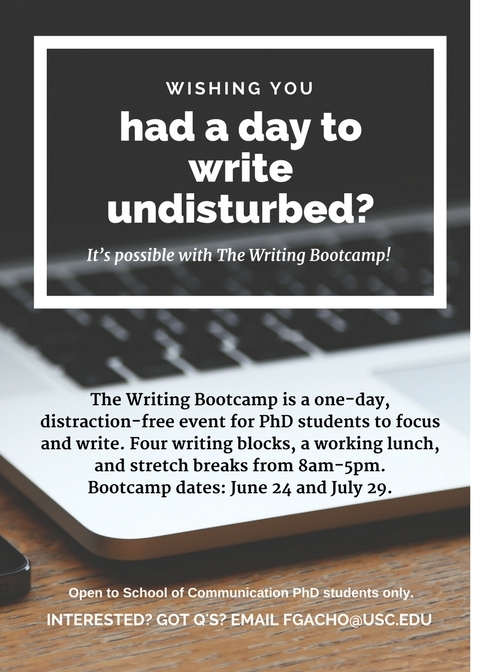 Because the schedule is writing-intensive, it is not recommended for writers in the brainstorming stage, research stage, or revision stage, even if they will be writing. Bootcamp is not intended for group or individual tutoring sessions with the Coach, though the Coach will be available for questions. Lunch will be provided. Space is limited to 6 people per bootcamp day. Saturday, June 24, 2017 8:15 a.m. – 5:00 p.m.
Saturday, July 29, 2017 8:15 a.m. – 5:00 p.m. Interested? Click here to RSVP. Your RSVP is your commitment to attend the full day, including the lunch discussion.